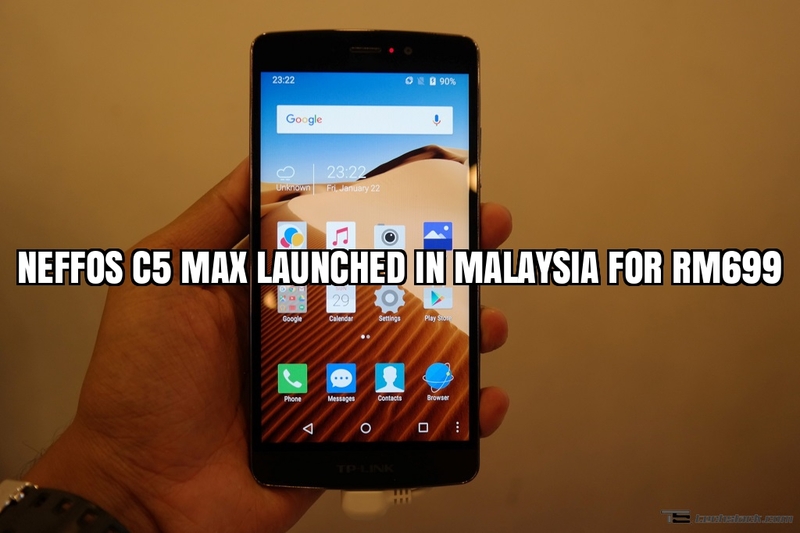 TP-LINK Malaysia have officially unveiled the availability of Neffos C5 Max earlier today in an event held at Talent Lounge, Damansara. For those who have not heard about Neffos smartphones in Malaysia, they’re under TP-LINK and have unveiled two phones previously which are the Neffos C5L and Neffos C5. The Neffos C5 Max is the higher-end model compared to the rest followed by the C5 and the lowest end C5L. For the Neffos C5 Max, it is TP-LINK’s first smartphone with a Full-HD IPS Display which is sized at 5.5-inch and protected by Corning Gorilla Glass 2. Under the hood, there’s 2GB of RAM while the internal storage is set at 16GB which you can expand via it’s made available micro SD card slot up to 32GB. The processor is powered by MediaTek’s MT6753 Octa core processor clocked at 1.3GHz while the GPU is managed by Mali-T720 MP3. This smartphone is a Dual Micro-SIM device with both of them having 4G LTE (CAT4) enabled. The camera is not a disappointment as it comes with a f2.0 13MP main camera while the front selfie camera comes at 5MP and has wide-angle lens. The Neffos C5 Max comes out of the box with Android 5.1 Lollipop with Neffos’s Android Skin-On with minimal bloatware. Other than that, there’s Dual noise reduction MIC which is said to improve the overall call quality experience. Last but not least, the battery capacity is set at 3045mAh and it is removable. This is probably the best part of the smartphone itself having a pretty neat battery capacity. Overall, I felt the smartphone is pretty smooth and attractive with great potential during my short usage at the event. The Neffos C5 Max is priced at RM699 inclusive of GST and available in two colors, Dary Grey and Pearl White. At the moment, you can only purchase this smartphone via 11Street as its “exclusive” at the time being. Therefore, the first 50 lucky owners will be eligible to get a free Groovi Ripple Bluetooth speaker worth RM159 via purchase on 11Street. Do take note that this offer is only valid from 28 June up to 10 July. Direct product link to Neffos C5 Max via 11Street – Click HERE. A little tip for you guys, you can apply vouchers that you get via 11Street itself to purchase this smartphone at an even lower price. Fiddle with 11Street if you’re not used to it.